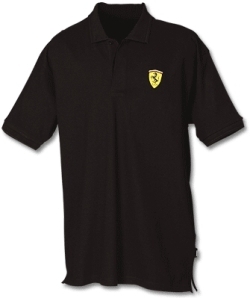 Black Classic Ferrari Polo Shirt. Men's classic 'Fly' button polo with an emblem on the left chest. 100% cotton. 230g premium pique fabric. Ferrari logo embroidered subtly in grey on the back of the neck. Available in size S, M & XXL.